We have done cooperative counter drug operations with the Netherlands Navy in the past. Early last year, the Netherlands OPV Zeeland embarked both a CG LEDET and a CG helo det. Perhaps we could run a test using the Johan de Witt or her sistership Rotterdam to try out the mothership concept. Their crew size is similar to that of the National Security Cutters (less than that of the Hamilton class), but they have berthing for hundreds more. They have aviation facilities for up to six helicopters. They can handle boats from both davits and a well deck. They have excellent Command and Control facilities. “The ships have a complete Class II hospital, including an operating theater and intensive care facilities. A surgical team can be stationed on board.” That could make them welcome in a lot of ports. Would the Dutch be interested? The Dutch Navy has already demonstrated its commitment to counter drug trafficing. They have used these ships several times for counter-piracy. Counter drug operations are not that much different, and piracy seems to be in decline. When it was being finished, there were reports that the Dutch wanted to sell the Johan de Witt. 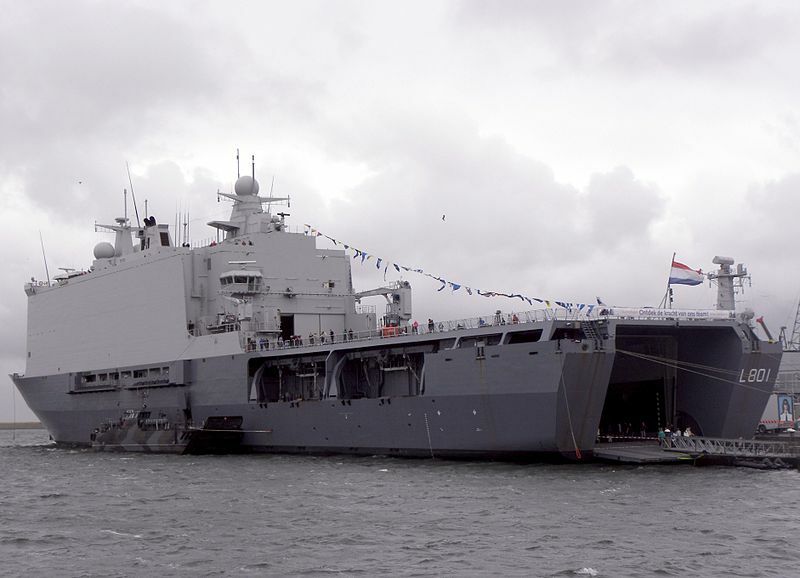 Operating off Latin America might be seen as an opportunity to demonstrate both this class and the Netherlands’ ship building expertise in an international market. What might the experimental effort include. In addition to the mothership, perhaps three MH-65s, add a mix of Webber class WPCs, WPBs, Response Boat Mediums (RB-M), and Navy Riverine Command Boats (the US Navy version of the Combatboat 90). In addition to its counter drug objectives, the deployment might be seen as a partnership station effort, training as well as working with the locals, and if there should be a natural disaster while they are in the area, it will be a ready made Coast Guard response. This entry was posted in International, Operations, Ships, VBSS and tagged mothership, partnership station by Chuck Hill. Bookmark the permalink. If we ate the fuel costs they’d probably sign right up. If there is a substantial effort to help the locals, it might be possible to get the State Department to do that. Since the US Fourth Fleet part of SOUTHCOM has very limited to none surface assets in its AOR, I think Chuck has a good idea. Pay our allies to provide a mothership for ops down south. The British and Dutch have interests in the region and have deployed ships there. I recall an Bay class LSD(A) working with the USCG last year? I have never heard of HNLMS Johan de Witt being up for sale. That was the Joint Support Ship Karel Doorman (http://en.wikipedia.org/wiki/Karel_Doorman-class_support_ship). Thanks, seemed the Netherlands Navy was very effective in their counter piracy operations. The ships are not for sale, BUT the USN has operating funds which could be used to support their deployment. Paying for fuel is a big ticket item and they could be provided free port services at say Mayport or Key West, assuming they are going to SOUTHCOM/Fourth Fleet AOR? We don’t necessarily have to look at foreign naval vessels. There is always the option of chartering a US flag OPV, OSCV, or even larger ship to support joint ops. MSC has recently had RFPs out for Maritime Support Vessels. MSV is probably a good generic term to use as any. I dislike tender because it alludes to a stationary ship. I think a USCG MSV needs to be more mobile and perhaps forward deployed? We got to watch what type of ship we are talking about~ There are warship OPVs, there are constabulary OPVs and then there are logistics oriented OPV more accurately OSVs.